Got some questions for you about the tutorial. It's great in terms of technique, I didn't know it could be that easy actually. But, what about clean up? What does that involve? Brush care if any? Varnishing the finished model, how is that affected? How about handling and getting oil paint elsewhere that it's not wanted? Can you paint over the oil with regular paints? What colors did you stipple on there? Why doesn"t the finished rock look like the really natural ones in the first picture, those are amazing. I'll be updating the article this morning too - GREAT questions. Thanks! As for the post and the questions, take your time, those were just a few things that came to mind after I read it and I want to make sure people have all the info they need to do something like this. And the post is updated. Those were great questions and reflected several assumptions on my part. Assumptions made by someone who does it effortlessly. You have to spell it out for us mouth breathers. Before I go any further, credit goes to misterjustin and the other FTW writers for their attitude towards helping other hobbyists. The fact that I can pose a question to them and they will go out of their way to answer it says volumes about them as bloggers and gamers. And here's my point and the reason for sharing this email exchange. When we post about something we've done a hundred times over, if we're not careful, we can mistakenly assume everyone else knows how to do everything we know how to do. We assume our readers have the same skill and knowledge as us. To some extent this is acceptable... with things like general 40k background information and stuff like that. But when you get into advanced modeling/painting techniques that you've been working on for some time and go to explain it to another person, you almost have to start at the beginning since they may not have the experience you already have through much trial and error. The rock painting tutorial was a perfect example. With the step by step information that misterjustin had in it already, it worked perfectly for the advanced painter who had a good bit of knowledge and experience already under his belt. It would be yet another perfect little trick they could add to their painting arsenal. 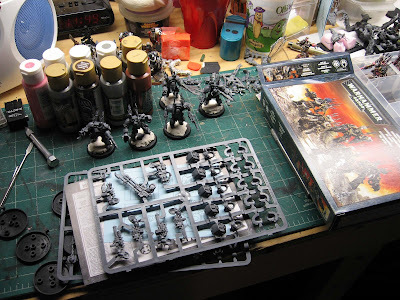 After adding the answers to the questions I gave him, it works for a much broader audience and is accessible to even beginner painters who are willing to try something new. Now it covers both types of painters and can be used by even more people. So keep this in mind next time you go to write a tutorial. Does my post answer all the questions someone might have after reading it? Does it have links (or whatever else works) to help readers find other articles that might help them with this? Do I explain everything they need to know to be able to do this on their own? It's no accident that I include so many links to previous posts here on FTW. I know most of you all have seen them before and skip right over them while reading, but for the one person who wants to know how something is done, that kind of stuff is invaluable. Adding the first couple steps to something or explaining a technique in detail can really help someone just starting out. It can be tough work to write a well thought out and composed tutorial, but it's definitely worth it. I know I appreciate it. Once again, another thought-provoking post, especially the internal dialog with Misterjustin. We have all had these types of conversations that have made our hobby experience better, and sharing it is a great contribution. I think Ron hits on a good point here. Sometimes we don't have time to consider everything in advance. Readers should not be afraid to post questions when they have them, no matter how insignificant they might seem. Bloggers should follow up to every question or comment that people leave. If we continually follow up with each other and maintain a dialouge, we can enjoy exchanges just like the one shown above. It just takes a little effort. It's like they say there's no such thing as a stupid question except an unasked question. I think that you make a very solid point here. I had been thinking about doing a greenstuff 101 to link to in the beginning of all of my tutorials on sculpting to set people off on the right foot. So many of the questions that I get from people when they look at my work repeat that such an article would almost write itself.